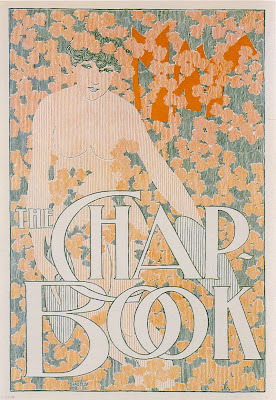 The name "Chap-Book" came from the earliest days of printing. In the sixteenth century chapbooks — or "cheap" books — were short pamphlets, often illustrated, that contained folk stories, remedies, and other popular literature. I like the colors in this. Does she have symbols in her hands? That is beautiful...I love how the whole thing is made up of the same type of hatching line.